Hello and welcome back to my 2nd day Guest Designing for MFT. This is the cutie-patootie Pure Innocence - Lucky Us, she's just sooooo sweet. I coloured her with my Zig markers, used the matching die-cut to cut her out and added her to a smooshed distress inked background. I added sequin embellishments and the little horseshoes from the Die-namics Lucky die set. 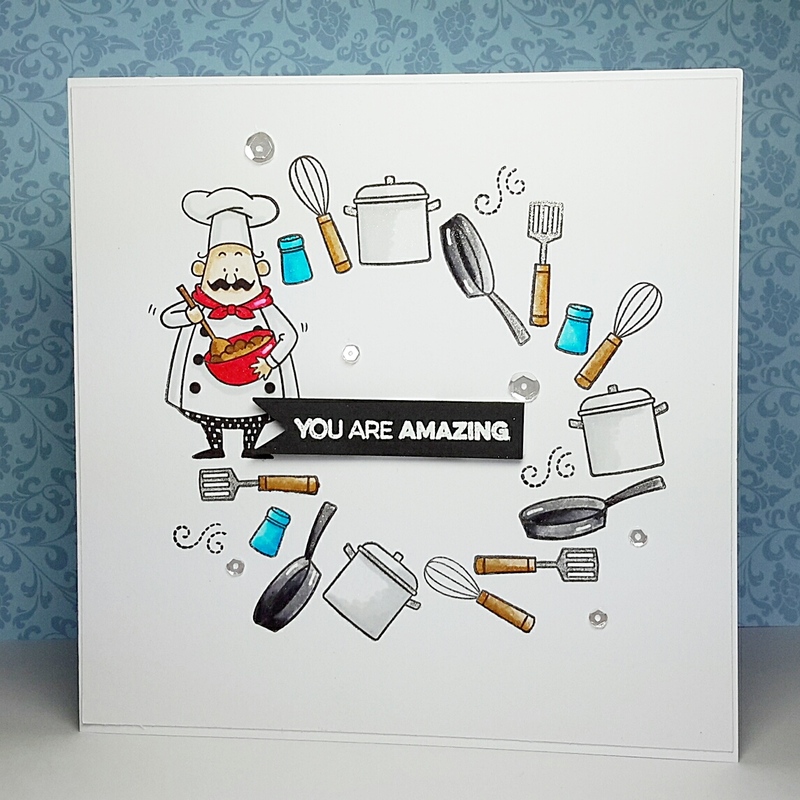 For my next 2 cards I used two of the cheeky chefs from the brilliant Recipe For Happiness stamp and matching die set. In the one above I wanted to create the impression that the chef was juggling his kitchen tools. All of these pots n' pans, whisks n' spatulas are in this set. As well as 4 chefs and a whole host of kitchen tools, you also get lots of fabulous sentiments. On this card I used the chef and his tools of the trade to create a circular framework to highlight the sentiment which is part of one of my favourite MFT stamp sets called Amazing. If I hadn't already purchases the Recipe for Happiness stamp set, I'd be rushing out the door to get it! Absolutely love the set and the cards you made with it are amazing and fantastic! The first card is sweet but my heart is with the chefs, always looking for someone to cook for me! 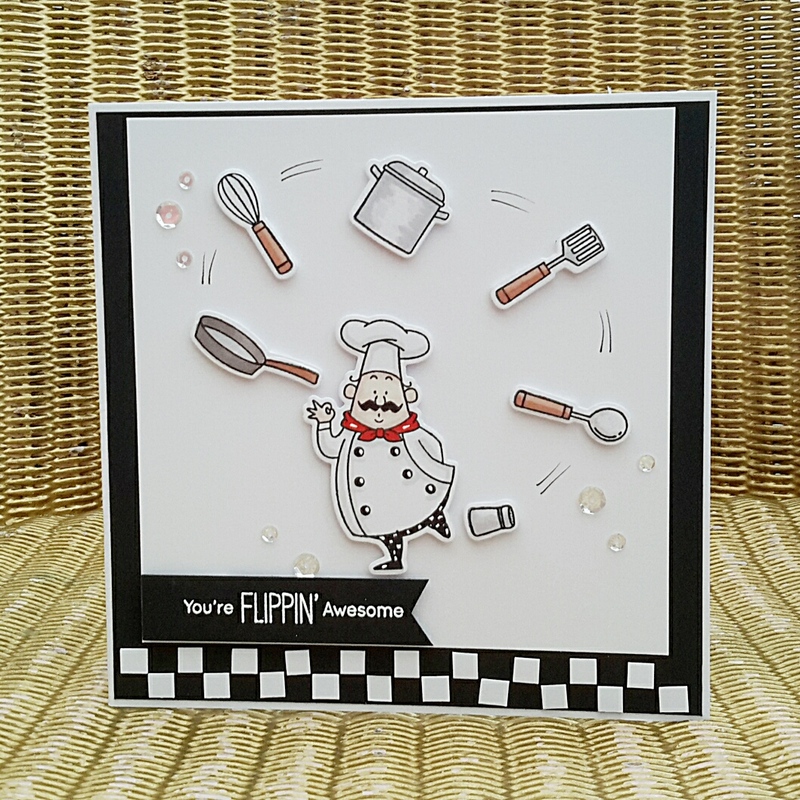 Three brilliant cards Jane..love the smooshed background on number one and the little chefs juggling his kitchen utensils is awesome..I love the circle of utensils with the last one too..fabulous selection..